I discussed the debut of Zebulon Sixkill in Sixkill, Robert B. Parker's last Spenser mystery. After Parker's death, author Ace Atkins has continued the series and Sixkill's role in it. Zebulon "Z" Sixkill is only a supporting character in Cheap Shot. He might or might not make a list of the top 10 characters in the book. But it's nice to see Atkins continuing to use him. Sixkill adds some fresh blood to the Spenser formula. Sixkill's background as a Cree Indian is mentioned a few times, but it's mostly ignored. That's the way it should be. Being Indian will come up occasionally if you spend time with an Indian, but that's about it. It's like anyone's ethnicity, religion, job, childhood, hobbies, etc. It'll come up now and then, but it's rarely the center of attention. Parker overdid it in Sixkill. Perhaps a quarter of Spenser's interactions with Sixkill made some reference to his being an Indian. That's way too much. As for the rest of Cheap Shot, it was a solid mystery until the end. Then Spenser and company got handed a few too many answers without working for them, and it petered out. Still, Atkins did an excellent job of mimicking Parker's style. 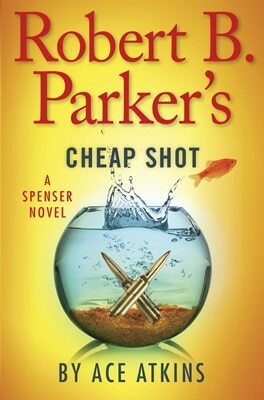 Cheap Shot was at least as good as the typical Spenser book by Parker--maybe better. The books aren't great literature, but they are entertaining diversions.